It will be easier to understand all the above with an example. Let us think of developing a universal remote. Our UnversalRemote will have only two buttons, one is to power on and another is to mute all associated ConsumerElectronics. For ConsumerElectronics we will have couple of implementations Television and SoundSystem. Button is a class that is the invoker of an action. OnCommand is used to switch on a ConsumerElectronics. While instantaiting OnCommand client needs to set the receiver. Here receiver is either Television or SoundSystem. UniversalRemote class will maintain all the receivers and will provide a method to identify the currently active receiver. Implementations of java.lang.Runnable and javax.swing.Action follows command design pattern. Comments on "Command Design Pattern"
Nice Explanation …………………… Please explain MVP Design Pattern too.. Interesting explanation. Please provide your way explanation to Session Facade. I have red in many articles but not satisfied. Good effort. I appreciate the way you present the content. Well organized. In my view this article is missing one point that is, its Real Time usage in Projects along with general problems we face while implement it. If it was included in it, then it would be perfect. I would be more happy to look forward such articles with Real Time situations (when we will choose this pattern) along with general problems. very nice, but does it require to keep the instance variable of the commands same? So that DemoCommandPattern need not write code specific to a command. Please correct me if I am wrong. One doubt..Don’t you think that Button should be part of IniversalRemote class? Your tutorials are too good to miss! I think in the diagram UniversalRemote does not need to have an association for Button. I want to maintain the state of checkboxes across pages. What happens is when i check one checkbox and then go to say 2nd page then check one checkbox there and when i return to previous page the checked box is again unchecked. Means the status of the checkbox is not maintained.If it is maintained then it should show checked. I am using jsps and display tag in jsp for pagination. Your articals are really just awsome. The way you explain was really cool. I am still in between reading your blogs on design patterns..
Can u please give a clarification on how to create dynamic objects along with new instace of a class? If it is explained in any of the design patterns please ping me that link..i’ll go through it. What am expecting is something like this. At the end what i want to acheive is to find the number of instances of that particular class. Is there a way to find objects present in one JVM from another JVM? use a filter.and one map which will keep stock of pages in terms of mapping or path info and check box status. if any changes happen modify the entryset of map retrieving it from session. instantiate the map on session listener’s activate session.and put that in session. Hello Joe,How to read any number of lines from the console in java? Why do we really create this complex structure ? 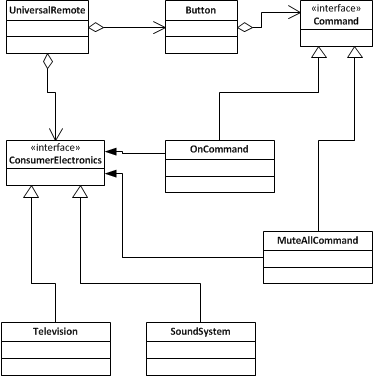 When UniversalRemote already has access to ConsumerElectronics, why not directly invoke ConsumerElectronics.on() and ConsumerElectronics.muteAll() methods, when the appropriate button is clicked, what is the advantage of creating the intermediate classes like Command ? If aim is to keep the receiver and invoker of command decoupled from each other, intermediary interface is needed. Most of the design pattern based on this design principal. “Classes should be open for extension, but closed for modification”. If I have to add ConsumerElectricals to be switched on from the same Button class, then the scenario that have been suggested by you ask me to modify the existing button implementation which violates above rule. However with the Command patters design would be like this. This article is really very useful for the beginners in Java. I really appreciate the effort you put in explaining in more diagrammatic way. I got a question… why @Override annotation is used only for one method (mute()). Is it a typo or any other reason ? Rakesh added extra value with his comments giving some coded explanation. Joe, you deserve a Hip, Hip, Hurray! Isn’t MVC pattern part of the observer design pattern? This pattern is too complex or confusing… The examples given here are very nice and could understand but I was not able to correlate exactly on how it is implemented in JDK – Runnable and Action implementations. Very Nice description Joe. You site helps me a lot. Dear Joe, please include some the use cases of this pattern in real programming problems. Comments are closed for "Command Design Pattern".